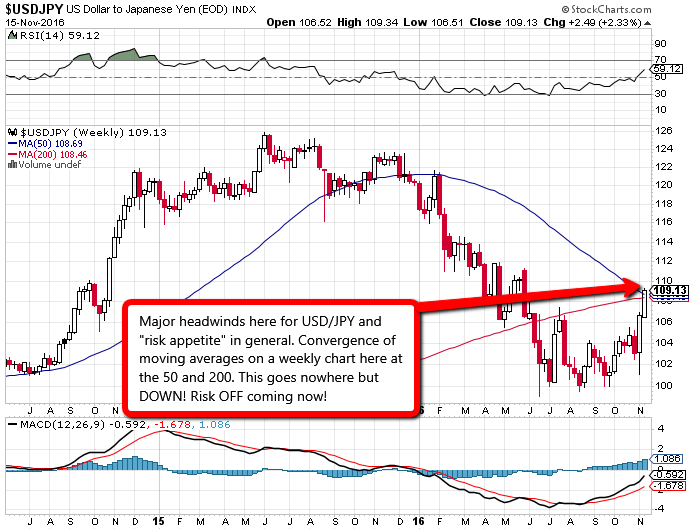 The currency pair USD/JPY ( U.S Dollar vs Japanese Yen ) is a bellwether for “risk appetite” in markets. Simply put, when the currency pair rises…..risk is ON. When the currency pair falls – RISK OFF. Risk ON meaning……the general investing community is in “buy mode”. Risk OFF meaning – “sell mode”. I’ll let you be the judge….as “per always” – you can lead a horse to water – but you can’t make’em drink. This chart looks terrible. After months of consolidation( June, July, August, September ) and now with the recent run up into “and after” the U.S election, USD/JPY finds itself at an interesting junction. You don’t see this in equity/stock markets as they only give you a tiny glint into the real world economy ( if any insight at all, considering the money printing and Wall St. corruption ) but…..currencies don’t lie. USD/JPY will very soon turn. Global stock markets soon to follow so I challenge you to consider…. Are your assets currently protected? Stop losses? Mental stop losses? Greed got you by the balls? Any notion “what so ever” that…..tides may turn? I’ve softened over these past years as….the Central Banks have made it impossible for the average “at home investor” to even consider things moving lower. 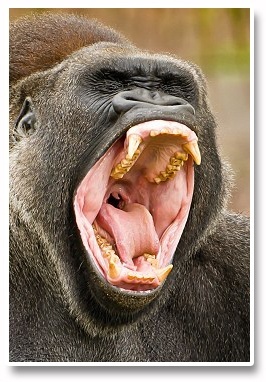 I’ve “sung to the choir” at least a handful of times over the past years…encouraging my followers to exercise caution. I’ve been right at times….and horribly wrong at times. How does the recent announcement by the Bank of Japan to buy an unlimited amount of debt at fixed yields affect your analysis? This has put a ceiling on JPY yields and has resulted in usdjpy soaring above 110.00. Not sure how to make sense of US equities at the moment; Soaring US$ yields should make debt more expensive yet US equity markets hitting new All Time Highs. Even a hawkish Yellen and the prospects of a Dec rate rise is having zero affect on the near relentless rise in stocks. Perhaps everyone is front running the Xmas rally, perhaps everyone simply believes President Trump will fix everything and every US business will be great under his tenure. Feels like a blow off top. Great analysis – blow off top – right on the money as…..
Ive got several friends now hitting me about buying buying buying that I.ve not heard from in many months. Pretty good indication that retail is hot to trot here……dump to follow. Not so sure now that this is a blow off top. According to Goldman Sachs, if Trump does enact a repatriation tax holiday for firms, this could add $2.5bn in stock buybacks which could rally the market even higher. I wouldn’t bother shorting this market. The past week, S&P has not traded below the prior days lows at all, Looks like much anticipated FED rate hike will not make a difference. There are many reasons why this market should be nowhere near this level but at the moment, the optimism that Trump has brought will hold the market to near ATH’s until his inauguration. AT the moment, every down tick is a tough battle whereas the upward tick happens fast and violently. Commodities are rallying (a potential Trump infrastructure bonanza) this is helping markets. Looks like the inflation trade is taking hold which is basically long commodities, long stocks, short treasuries. Are you running a scam here? why are you not replying my subscription? Watch for your refund there in Paypal Sanjino. Sorry for the delay. We will have the members area re open here pronto so please stick around!